Wider doors can greatly enhance the convenience of a floor plan while improving the aesthetics of a home. If you’ve ever wanted to know how to make a door wider, this quick guide should prove quite helpful. First things first, you’ll need to remove the old door from the frame. 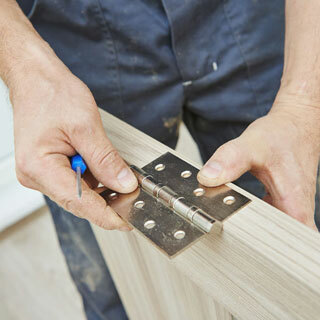 Carefully remove the screws from the hinges while supporting the door’s weight with shims. Have a helper steady the door as you remove the screws to avoid bending the hinges or dropping the door on your feet. Next up, you’ll need to gently pull the old crown molding or trim away from the opening using a pry bar. A multi-purpose painter’s tool can be used to create a gap between the trim and the wall. Finally, remove the old door frame in one piece if possible. Use a jab saw or a utility knife to trim the drywall so that the rough opening of the new door is fully exposed. In most cases, you’ll be cutting the drywall over to the next stud beyond the original jack and king studs of the existing opening. If you’re widening a doorway within a load-bearing wall, you’ll need to build a temporary wall to distribute force during the renovation process. Cut out the old 2×6 header as well as the jack and king studs of the old rough opening using a reciprocating or jig saw. Use the rough opening dimensions recommended for your new door to guide your layout decisions. The header will be made from two 2×6 boards with a piece of 7/16″ OSB in between. Be sure to add 2×4 cripple studs to the top of the header. With the rough opening framed, you can install fresh drywall up to the edge of the doorway. The alignment of the drywall doesn’t have to be incredibly precise since the gap will eventually be covered by molding. Use 1-1/4″ coarse thread screws to secure the drywall. Lastly, you’ll need to apply a layer of trim to the rough opening to accept the new door and its frame. Cut 1×6 boards that are as thick as the wall to the appropriate lengths and nail them to the jack studs and the header.